The Spice & Tea Exchange inside Mickey's Pantry in Downtown Disney sells several spice blends and some of the come in grinders. 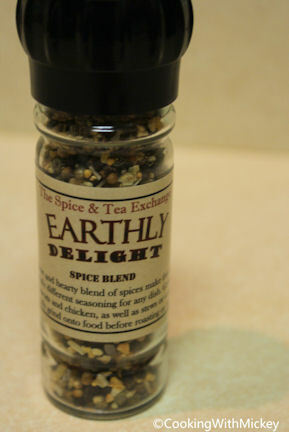 The Earthly Delight is perfect for steaks but can be used with chicken, pork and other meats. I rarely eat steak so when I do I want the best cut of meat. 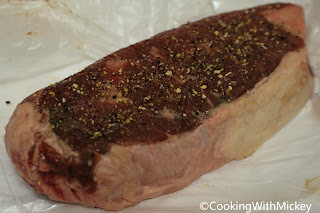 I picked up a NY Strip Steak from the custom cuts section of Publix. 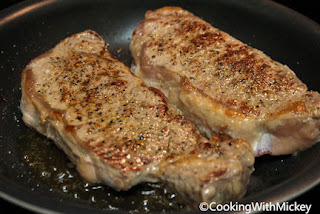 I seasoned both sides of the steak well before cooking in the skillet. Normally I'd grill the steaks but when it rains sometimes you have to improvise. One important thing to do when making steaks is to make sure it has a nice crust on the outside. This will help keep in the juices. I cooked the steaks medium rare to medium which is how I've always liked my steaks. If they are cooked any more than that they start to lose their flavor. 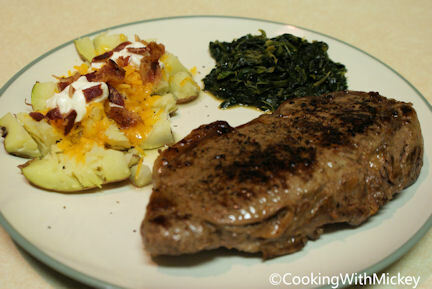 I served the steaks with sauteed spinach with red wine, smashed potatoes topped with butter, cheddar cheese, sour cream and bacon. And you can't enjoy a good steak without a glass of great wine, well at least I can't, so I had one of my favorites - Frontera. The combination of mushrooms and peppercorns enhance the meatiness of the steak. While the cinnamon, nutmeg, clove and star anise add a little something extra that you'd never know was there if it wasn't on the label. Have you tried Earthly Delight spice blend or any of the others from The Spice & Tea Exchange? If so, share your thoughts in the comment section below. 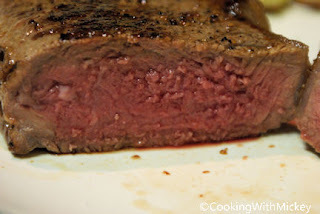 I agree, if steak is cooked anymore than rare to medium, it is overcooked!! !